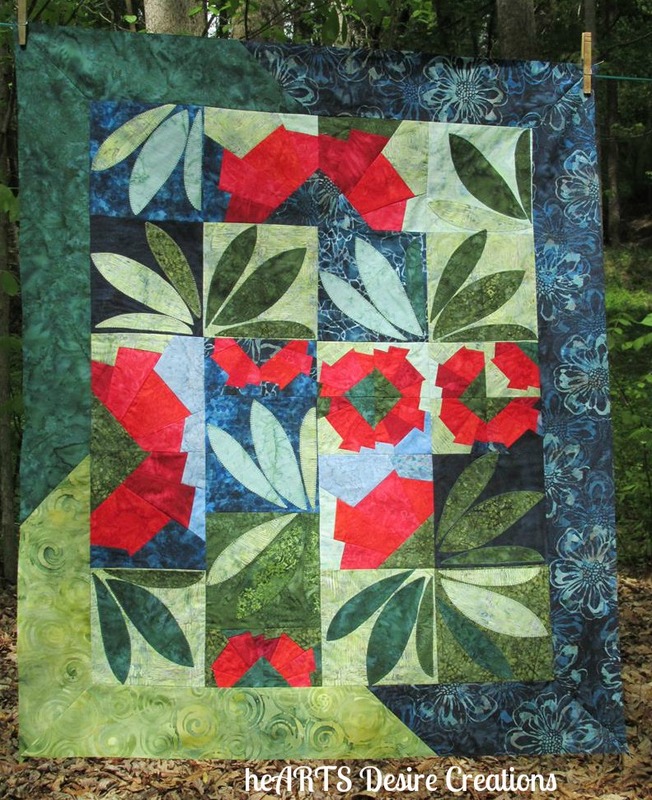 The Pohutukawa (New Zealand Christmas Flower) quilt top is now all together. I completed the last of the blocks over the last two days, put the blocks together and added the border. Three fabrics were used in the border, piecing them on a diagonal. I really like the look of this – especially for a wall hanging. The border corners are mitered – something I haven’t done in a while and had to put my thinking cap on! My next challenge will be to quilt this piece. That, however, will wait until after retreat which starts Thursday. I will be heading to Blowing Rock on Wednesday – a little R & R for myself before all the fun (and a bit of madness) begins! The next couple of days I will be finishing last-minute details for the Quilt & Sew-In Retreat 2015. Retirement has afforded me so much time to do things I really enjoy. In the last month I have completed four books and done much organizing. Good Will has been the recipient of a couple of carloads of “stuff.” The sewing studio has also gotten a bit of a clean out and reorganization. And…much sewing has been done. This wall hanging was begun years ago and I am thrilled that it is now together. And this Christmas season it is sure to be hanging on a wall in my house! Posted in Fabric, Quilting, Quilting Retreat, Stash and tagged Art Quilt, Christmas Quilt, Color, projects, Quilt, Quilting. Bookmark the permalink. Oooh, lovely! And I do like that pieced border as well. I’m sure there will be lots of compliments when people see it on the wall at Christmas time!